Click on the YouTube logo on the right and visit our channel with lots of videos about our products. EPI Plastics manufactures products using injection and blow moulding in Dunedin New Zealand for clients all around the world. Products we make include bottles, jerry cans, jars, toys, air-tight containers, D couple (Sankey) Keg Caps, pottles, caps, lids, jugs, plasterers caps, promotional products, printing, advertising material, key rings and tags, pens, trays, plates, cups, tumblers, bowls, baskets, funnels, honey containers, kitchen products, buckets, toilet trainers and bathroom products, drink bottles, watering cans, weathervanes and gardening products. We are also a large manufacturer and distributor of promotional products. We only use the best BPA free Food Grade plastic (except four our waste/recycled plastic bucket). Our factory has an audited HACCP Food Safety Programme. Our most popular product, our 20 Litre Jerry Can comes in three varieties, our cube shaped Food Grade and also UN DG, plus our Rectangle 20L. We make a range of bottles from 225ml to 2L, and 4L, 5L, 10L and of course our 20 Litres. Promotional Products: Printed pens, drink bottles and more. EPI Plastics now has a UN DG certified container to carry Dangerous Goods. Code and stock colours: 9996DG for natural/opaque. More colours will be available - please let us know what you would like. Very similar shape to our Foodgrade 20L jerrycan, but using a special DG plastic and moulding techniques. Includes the 58mm TE (tamper evident) cap and bung (BSP thread). A brand new bottle from EPI Plastics. 225ml, with a 24mm cap. Available in natural, pack size 180 (MOQ). An exciting new product to our already large range of bottles and jerrycans that we manufacture. Click image for bigger photo. Click here for more info. We already product a bottle clip to hold 4 bottles of beer or RTDs. 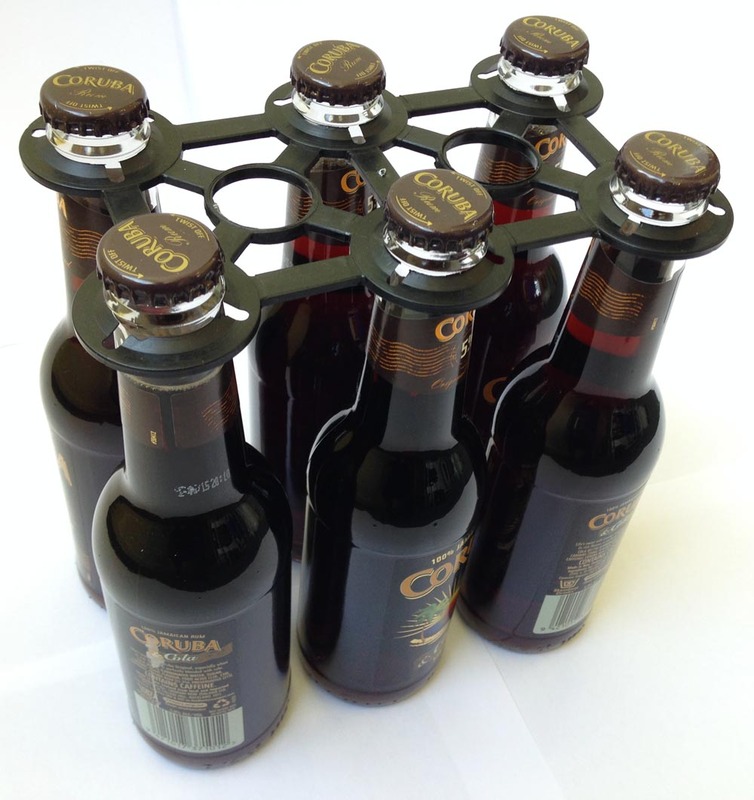 We got so many requests for a 6 bottle clip holder that we've produced one for you. Pack size 1000. Don't forget our other great products for the alcohol industry. The 4 pack bottle clip and our beer kegs. Also, we sell a tremendous number of jerrycans as well. 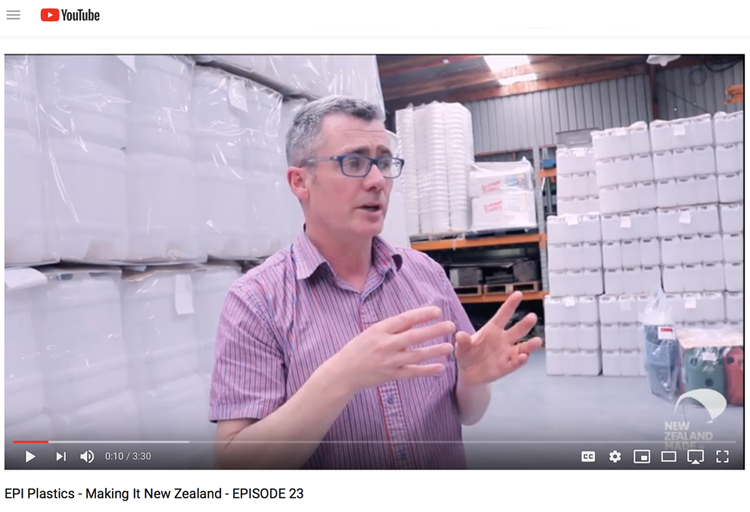 In June of 2018 EPI Plastic's (owned by Passion Plastic EPI Ltd) Food safety system was reassessed by Telarc New Zealand. Our documented and implemented programme meets the codex alimentarius (of the UN) requirements for food safety, relevant sections of the food standards code and good manufacturing practices. At EPI Plastics we only use FDA approved Food Contact Safe Plastic for the manufacture of our bottles, jars, jerrycans and other food containers and products. To the left is the technical information on the plastic that we use indicating that it complies with US FDA 21 CFR 177.1520. EPI Plastics staff had training provided by AssureQuality, consulting help from QCONZ (Quality Consultants of NZ) in the preparation of the programme. The subsequent programme and implementation was approved by Verification NZ. Re-certification is undertaken by Telarc. Manufactured by EPI Plastics in New Zealand. This amazing bottle eliminates the annoying "dry firing" from a near empty bottle, you'll get that last drop out. For our 10L & 20L (and other popular brands). The tap can also be interchanged and with the bung at the bottom. Very versatile. For our 10L & 20L jerrycans (and other popular brands). Includes a dust cap and washer/gaskets to prevent leaks. Approx 220mm in height. Our 10L and 20L jerrycans come black caps. Extra colours are red, yellow, green, orange and blue. Also we now have BSP thread bung cap. EPI Plastics makes a large number of FDA approved foodgrade plastic containers in our factory with an audited HACCP based food safety programme. Our 20 Litre Cube Jerrycan is most suitable for Emergency Water as it is about the right size for the amount of water required for one person to get thru a disaster. These jerrycans that are excellent for emergency water are available from Mitre 10, Storage Box, Plastic Box, Payless Plastics, Hammer Hardware, New Zealand wide, survival supply companies, Bunnings Christchurch. If you want to become a reseller of these containers please contact us at EPI Plastics as we do not sell direct to the public. Information about what water to put in the containers, how long it should be stored and how to disinfect the water is contained in our ebook. Click on the image to the right. Click on the image of the ebook below to get all the information you need about emergency water. 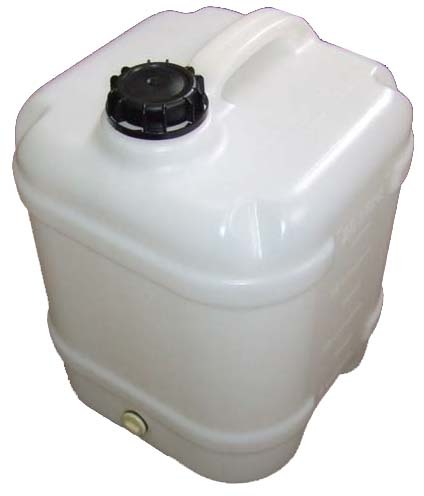 This is the new 10 Litre Jerry Can by EPI Plastics. It is now in full production. This is a stacking cube shape. Calibrated. TE (tamper evident) 58mm cap. Plus comes with a bung at the bottom. At present it is going through the DG (dangerous goods) UN certification process. All great for emergency water. Blue and Green colours are not stock colours, minimum special run size applies of 240 to get access to these. Set up fees apply. EPI Plastics also serves Australia and the Pacific, we have many satisfied and regular customers in our broader region. We look forward to doing business with our ANZAC buddies and our friends in the Pacific. We are 100% Kiwi. 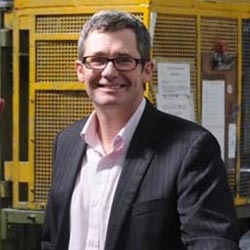 While our average age is 45, many of us have worked in the plastics industry for 30 years. So although we are young, hard working, friendly and honest we also have considerable experience. We really appreciate your business and look forward to developing a mutually profitable relationship. For more information visit our staff page. Do you want to become a reseller (wholesaler or retailer) of our products. Are you interested in getting access to our wholesale rates. We are keen to help you. If you would like to complete a credit application, download it here and send to epi plastics (phone, fax - numbers at bottom of the page or email it back. Please note EPI Plastics does not sell to the public (except promo products) we only sell to retailers, manufacturers, wholesalers, businesses, resellers and the like. We carry stock colours. However, we can also mould most colours for you. There may be an extra charge for this. The panel above contains just a few colours of the many thousands available. This website largely contains products for which we own the moulds and intellectual property rights. As such we hold large stocks and can deliver fast to you. If your order is particularly large or for reasons beyond our control we can programme production and dispatch fast.